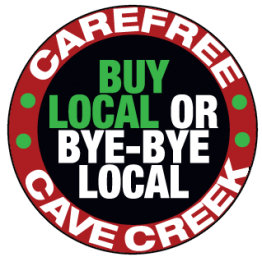 There are likely more restaurants in Carefree and Cave Creek, Arizona per capita than any other area in Arizona. 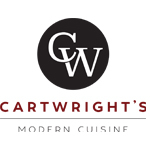 Cuisines include American, International, Steakhouses, Barbecue and the best Mexican food you will experience. The Town of Cave Creek is still inhabited by the rugged spirit of the Old West on which it was founded. Along its quaint main street visitors can while away many happy hours rummaging through quirky curio shops, upscale western shops and funky stores. From western wear to consigned designer fashions, home accessories, Native American crafts, pottery, postcards and souvenirs to fine art and furnishings, Cave Creek has an eclectic mixture of shopping. Well-known saloons, live entertainment, authentic southwestern food, ranch style BBQ and fine dining have established Cave Creek’s reputation as one of the most recognized and charming Western towns in the U.S.
Carefree, by comparison, could be considered the “new west.” Among a growing array of diverse boutiques, stores and restaurants, the downtown Carefree area boasts several topnotch galleries and jewelry shops, displaying some of the Southwest’s finest examples of native and contemporary art and design. Fine art, wine, gourmet food along with outdoor cafes and flowering courtyards all set in pedestrian friendly Easy Street provide a selection of dining and shopping experiences. The whimsical street names and gorgeous setting add to the ambiance. A short hop down the street brings you to El Pedregal, an enclave of shops and gourmet dining. The Bartlett Lake Marina opened up the Bartlett Lake Grill, the newest spot at Bartlett lake where folks can get their fill, on BBQ pulled-pork sandwiches and more. 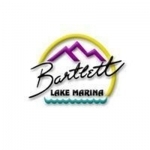 Guests can now relax and enjoy Bartlett Lake Grill’s deliciousness while enjoying the amazing scenery with friends and family. 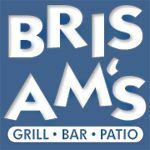 Brisam’s Grill, Bar and Patio is located on the north east corner of N. Cave Creek Road and E. Lone Mountain Road. This popular neighborhood sports bar and grill has been locally owned and operated since 2007. Employees and patrons alike have a long-standing relationship with this much loved community-involved restaurant. Brisam’s sponsors many local school sports programs and various church events. Brisam’s menu boasts a large variety of signature pastas, pizzas, salads, burgers, sandwiches and the popular Friday night fish fry. Full bar. NFL Sunday Ticket. Wall to wall football! Open 11 am to 10 pm – Monday thru Saturday. 11 am to 9 pm on Sundays. Welcome to Brugos Pizza, lovingly owned and run by Troy and myself, Christina Luisa (Cefalu) McDonald, Cave Creek residents. Growing up the way I did, I want our place to feel like you are coming over to our house for dinner! A homemade pizza destination for customers interested in great food, excellent staff, good service in a beautiful relaxed setting! Warning! 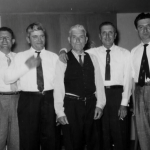 We are Italian family owned! Mangia! Cave Creek’s Award Winning Barbecue, pecan wood smoked to perfection. 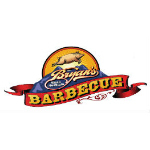 Bryan’s Black Mountain Barbecue, come try the New Taste of the Old West. We believe eating well means incorporating plenty of clean whole foods into our diets. CAFE meto offers a largely plant-based flavor forward menu with many gluten free, grain free, vegetarian, vegan, anti-inflammatory, and gut friendly options. Join us for breakfast or lunch, and enjoy salads, wraps with greens, nourishing protein additions, and a fresh juice bar with organic coffee. We’ve created meal options that help boost energy for the whole day—so that you can make the most of the entire CIVANA experience. 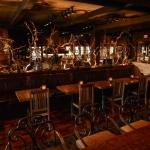 Nestled in the foothills of Carefree, comes your new favorite spot: Restaurant Confluence. Reimagined from chef Brandon Gauthier, the menu will still have a focus on fresh, and local but will be more of an elevated and modern cuisine. A casual lunch spot will turn in to a wonderful date night dinner place. Where did the name come from? Chef Brandon enjoys fly fishing, which is where the name came from. Along with his wife, who will be running the front of the house, they felt the word Confluence had meaning for them. Two rivers coming together: they both trained for many years under Chef Binkley, and have now merged into one, making their own dream happen, having their own restaurant. Join them for a wonderful experience and amazing food. Desert Mountain is a 5-Star Platinum Club of America, and one of the largest private clubs in North America. Located in the elevated foothills of North Scottsdale, Arizona, Desert Mountain spans more than 8,000 acres of lush high Sonoran Desert. The Desert Mountain Club has six Jack Nicklaus Signature golf courses, six distinctive clubhouses, nine kitchens, hiking/biking trails, horseback riding, and a spectacular tennis, swim, fitness and spa facility. We believe our employees are among our greatest assets. 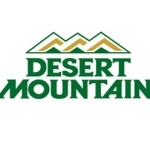 If you would like to be part of an exciting, challenging and rewarding experience, then Desert Mountain is the place for you!